Do you have to quit your job to travel? Quite frankly, the answer is no. It is possible to travel while working a full time job, you simply have to make travel a priority in your life. Traveling while working can be a balancing act. But unlike some other bloggers, I don’t feel comfortable with only relying on my blog as a source of income. That is why I still work full time; it means I have a steady income. I’d be a nervous wreck if I didn’t know where my next paycheck was coming from or if one was even coming at all. Don’t think my paycheck is huge though… I definitely budget. I went into more detail on how I afford to travel in this post, but basically it comes down to setting goals and prioritizing. I don’t spend a lot of money on clothes, accessories, or gadgets. Also, when I’m not traveling, you’ll usually find me at home since going out usually means spending money. When we’re not traveling, we’re usually at home working on the blog. I also started a full time job with a new company, one that gives me the flexibility to travel more. When I quit my 9-5 job, a lot of people thought I was making a huge mistake. I was leaving a “safe” government job with great benefits. But I wanted to figure out a way to travel more while still working a full time job. Through a good friend, I found an opportunity to work for a private company, one that allows me to work from home most days of the week. So even though I still work full time, the ability to work remotely has already allowed me to travel to a few new destinations. For example, I’ve flown out on a Wednesday night (which usually means cheaper airfare) and then worked during the day on Thursday and Friday. I was able to explore during the evenings on those work days, all day Saturday, and Sunday up until the time I had to head to the airport. Just one month after I started my new job, I took a 5 day trip to Seattle. But even if you have a regular desk job, it is still possible to travel. What I was doing at my old job was going on short weekend trips. Once in awhile, I’d be “sick” on a Friday or Monday to give myself an extra day of travel. I did have to make sure I had enough sick days accumulated though, and flights were usually a bit more expensive, but I made do. One time, my flight literally got in at 6 am on a Monday and I had enough time to go home, shower, and get to work. I was tired, but happy. So even if you are restricted a bit because of your job, traveling is possible. It just comes down to priorities. I also think there’s a huge misconception that you always have to go far to travel, which isn’t the case. Spending a weekend exploring a new city that is only a short drive away can be just as rewarding as flying thousands of miles to a new city. While exploring a city only an hour north of where I live, I discovered a restaurant with some great pad thai! 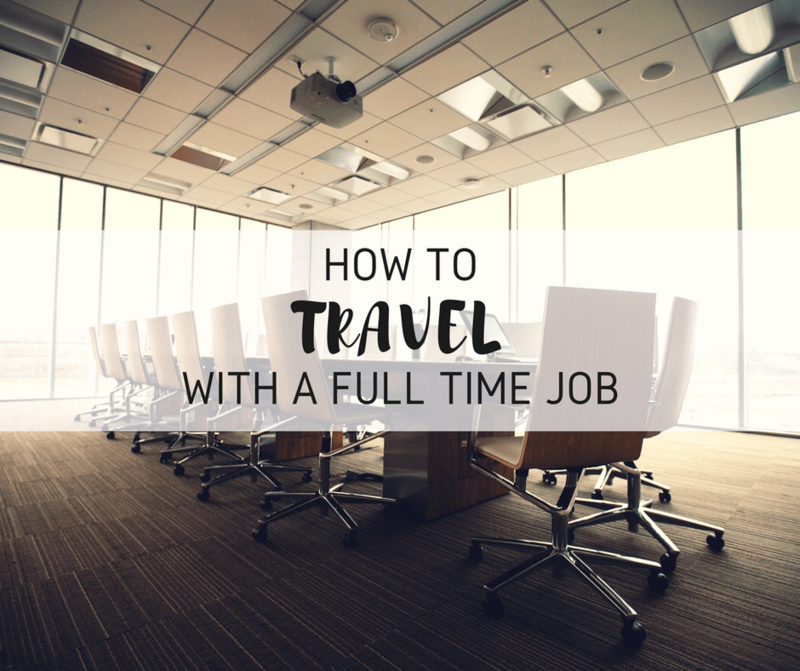 So you see, fitting travel into your life is totally doable, even if you work full time. It isn’t always easy and it takes some balancing, but I believe that if you’re truly passionate about something, you’ll find a way to make it happen. As always, spot on! Thank you for sharing your insights, Vicky! We have quit our jobs to travel the world and we’re glad we did! Now, digital nomads, it’s a complete different experience out there! This is very inspirational! I totally agree – i work because I like the stability of my regular job and I make travel a priority so that job does not take up more of my time than is necessary. It’s all about finding the right balance for you! I telecommuted for my job for six years and, honestly, it’s not a situation many jobs lend themselves to. Telecommuting especially isn’t a feasible option if you want to continue to move up, be considered for promotions and build a career. Face time with the team is just a necessity. That said, I also know there are way more people with traditional jobs that take vacations than nomadic travel bloggers. You’re right when you say you just have to make travel a priority. Maximize the holidays you get off from work for mini trips closer to home and save the vacation time for one or two big trips abroad each year. Great points. Bottom line is, there is always a way to travel. Always inspired reading stories like this! There are so many ways of funding travel. Working full time, part time, remotely or even getting jobs along the way. I’m glad you found the choice that works for you. Timing is everything. Scheduling travel to mesh with your work can be challenging and depends on the type of job you have. Talk to your boss to see if the company you work for can support you with flexible hours and schedules. I had a full time job for the longest time ( even when people think I didn’t )but I used weekends, long weekends, and long breaks to go somewhere to explore. I guess, I was used to work-airport and airport-work lifestyle. It is very possible and its true, you don’t have to go far to travel. This post is really helpful with great tips. It is really difficult to quit job and finance your travelling. One should definitely set their priorities right to achieve what they really want to do in life. So true that one doesn’t have to go far to travel. And working from home; both these factors enable you to travel with full time job. I am trying precisely that now. This is really a challenging thing to do, but definitely seems possible with your tips! Spot on. It is not always possible or feasible to leave the regular job, especially if you are just starting your career. It feels good when you receive the message ‘salary credited’ at the end of the month. It gives a base to one’s traveling career, with some riders. This is a fantastic post. I especially like the part about not having to travel far to get away. Sometimes those new cities nearby can be a great time.